If you've ever found yourself picking off your nail polish, sitting in your sweats with an empty carton of Ben & Jerry's wondering, 'Where are all the good men, and why isn't a gorgeous one standing shirtless in my kitchen mixing me up a pomegranate mojito?' I hate to tell you this, but it's your own fault. Not to worry -- I'm here to help you make that fantasy a reality, with one major addition: you'll be sipping that mojito with a big, glittering diamond ring on your left hand. Sounds too good to be true? It isn't. 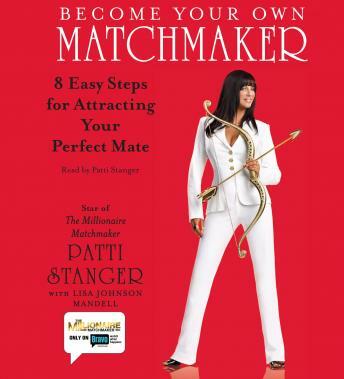 As a third-generation matchmaker and the president of one of the world's most elite dating services -- the Millionaire's Club -- I've put myself in the enviable position of being friend, confidant and relationship counselor to men and women the world over. I know what the good guys want in a wife, and what sends them screaming into the night. Now I'm sharing their secrets with you. I've compiled my best, tried-and-true advice and I'm going to tell you the things that even your best friend doesn't have the courage to break to you. If you follow my formula, the man of your dreams will appear in your life, and you can be in a committed, monogamous relationship with him in less than a year. Get ready -- I'm about to show you how to make all your relationship dreams come true. Nice to hear the tips that seem like such common sense, but sometiems you have to hear them. I heard a few that made me sit up and take notice, made me want to try a few ideas out, like her concept of making a list for what you want in a man.